Yes…yes what? Are you pregnant or adopting another China sweetie? CONGRATULATIONS…can’t wait for you to spill ALL the beans!! Something tells me you are having a lot of giggles over this! It isnt one word thursday??????????????????????????????????????????????????????????????????????????????????????????????????????????????? Okay, the YES is in pink….so it’s a girl?? (If I’m right, I KNEW I should have been a detective, and if i’m not then its a good thing I opted to just be a mom!) Then again, if I am right, becoming a police chaplain, does that count? You are killin’ me over here and ya’ know that’s not really nice to do to a woman who is post-menopausal and just lived thru a traumatic house fire and living for the last four weeks in a hotel room (where the walls on closing in on us) and with a son depl*yed with the special forces, right? Come on!! Take some pity – DO TELL! Ok Stephanie….That is just messed up. WHAT?!?!?!? OMG – Please don’t keep us hanging!!!!! ever hear of whisper down the lane?… lol, better go ahead and tell! 🙂 🙂 So far, we have a few pregnancy guesses, adoption guess, I’ll toss one in the ring and say your gerbil had babies? oh my goodness I kept looking at the ‘YES’ and the last time I saw letters that looked like that was on a pregnancy urine test stick. I hope that you’re planning a “Fill us all in Friday!” Please…tell!!! Oh my goodness! BUT how would you know so soon it’s a girl?!!! Ok…this is crazy! Either way, you are buying a new van!! Yep, a 15 passenger one…the BIGGIE!! It would be a very sad day if it were just a family pet….after all this. Please..details!! I bet you will update this when I am asleep and everyone else is awake! I knew you would go to China again! What’s her name? I’m guessing you’re adding a son(in-law)… a young man proposed and Tori said Yes???? This is amazing, agonizing and too fun! We await your reply! Nope….it’s pink so it can’t be a son-in-law. I’m thinking another China doll. You are SO naughty, keeping us in suspense like this…..dangling a carrot every night. I am so excited to hear your news, whatever it is I am sure it is wonderful, suspense is sufficiently built! Oh the agony of having to wait!!! It’s amazing how much torture this really is!! Whatever it is, I’m sure there is celebration at your house! OK, My guess is it’s a girl. From China. And you are using CHFS. Am I right?? I hope it’s the sweety I have had my eye on but couldn’t get an answer from them…..
My guess is that it is a daughter from China, maybe an older child this time? Have a great Friday (torturing all of us nosy bloggers)! You are all kinds of CRAZY!!! But it’s definitely the best kind of crazy. Take that bull by the horns! Talk about walkin’ the walk! I so wanna be like you!!!! CONGRATULATIONS!!! That particular YES, in that color…can only mean one thing! Woman…where do you get your ENERGY?? ok, that YES you have pictured looks like a pregnancy test color as it’s sort of pale pink. So my guess is you are pregnant. too funny! praise the Lord! and shannon’s comment about refreshing yor site while giving birth was hilarious! you have our attention! Congratulations to whatever your annoucement is! I will have to say though that 7 is my limit! you amaze me! Ok…so you are sitting back right now with your hubby giggling away….not funny!!! You had better give it up soon so we all don’t go crazy and wear out our keyboard from all that refereshing!! Can’t you hear all that clicking?? I wonder if your No Hands But Ours site is just too much for you–all of that special needs adoption happiness staring you in the face everyday. It can make a person do CRAZY things! Crazy in a good way! congratulations!!! I can’t wait to hear more: another club foot? Heart? Cleft? Come on!! You’ve bought a little puppy dog??? And laughing your head off with all these comments…..??? Are you trying to torture us? What kind of post is that? Do tell my friend! I’m going with Anonymous on this one…did Tori say yes to a prince charming maybe???? Congratulations Stef!!!!!!!!!!! Can’t wait to hear all about HER!! This is all wrong. Just so wrong. It’s just wrong. You should be ashamed of yourself, keeping the blogosphere in utter suspense and anticipation. Please, put our agony to rest. Spill. It. Now. So, how many hits you gettin’ today girlfriend??? Maybe in the neighborhood of 3, 4 thousand?? I’m just glad I wasn’t able to check blogs yesterday- that’s 24 hours less suspense for me…..can’t wait to hear. I couldn’t even HAZARD a guess!!!! You are one sneaky girl, aren’t you?! lol! You are NOT going to make us wait ALL. WEEKEND. LONG….are you???!!! I think we are going to have to pressure Rebecca into talkin’. Now…do you really want to do that to her?!?! Are you kidding me? I was expecting to get on here today to see some big announcement and still, you are teasing us. Do you have any idea the agony you are putting us through. I cannot wait to see where HE is leading you. ok….now this is cruel to keep us hanging! 🙂 You must post soon….this is killing me!! you are so sneaky. hehe. In the words of the immortal Ricky Ricardo, “Lucy, you got some ‘splaining to do…” Come ON!!! You have to know the suspense is killing us. WOOOOOO HOOOOOOOOOOOO!!!! I’m so happy for you! I can’t wait to hear the details. Please tell us the story! Soon! Now would be excellent! Please, please, pleaes! I am just catching up with your blog and everyone else…. I can’t wait to find out??? A Son in Law?? Is it one of the 10 year old girls from Lifeline?? How is sitemeter keeping up with your site today?? You know this isn't right; how am I supposed to get anything done today????? I have a few friends on the outlook too & we are supposed to call one another if the site gets updated before the other has read it….. Helllloooooooo????? Cornolio?????? You have to tell us!!!!! NINE is JUST FINE :O) Now spill it all!!!!! I love it! “Nine is just fine”! I think I will use that one on my husband when I am ready for one more! This isn’t fair!!! Do tell! OK, since it is pink, you must be giving us a hint! It’s a GIRL!?! And you could not know this already could you if this blessing was in your womb?!? Or at least you don’t look that far along??? We’re going crazy here! Not that it is any of our business but you are teasing us! Is this going to be a Valentine’s Day surprise? I hope so. I am counting on hearing about your new daughter tomorrow. That is what this is all about, right???? Can you just tell us WHEN you are going to tell us!!???? 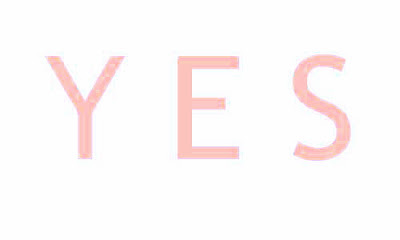 Ok, I just came back and saw your “Yes” was in pink. Oooohhhhhh, girl… you better spill the beans soon. You have the entire bloggy world going crazy! Yep, I’m with Jenn. If you could tell us WHEN you are going to tell us what in the world this all means I could go back to normal life, stop neglecting my children and hitting refresh every 15 minutes. Just kidding…well part of it I’m kidding about…COME ON SISTER! I have nothing new to say that others haven’t…WHAT, WHAT, WHAT??!! You are totally just reading these comments and cracking up to yourself, aren’t you??? You’re going to have some sort of revolt on your hands soon!!! Congratulations if we are ALL right!!! Oh gosh, don’t make us wait until Monday girlfriend! I have a feeling based on the picture with nine balloons and you have eight kiddos…hmm, maybe number nine is on the way???? I HATE waiting I always need to know and I need to know NOW!!!! This has gone on long enough!!! Please, tell us all the details!!!! Tonight! Well this is just absolutely hilarious. If I’m laughing at all these comments I can only imagine enjoyment you are receiving from these comments! So I too am guessing that Miss Tori may soon be a Mrs. Can’t wait to find out for real! So I just have to know how you keep talking your DH into this!!!!! Wow girl! I love your blog, you keep me laughing all the time. Congrats and can’t wait to hear the full story. I bet its good. Yay Stefanie!!! I know I sent my congrats in my email, but just wanted to say it again – CONGRATULATIONS!!!!!!! That is soooo great and I am so excitd for you all!!!! !